'Quick, play Hey Jude': Paul McCartney's recurring nightmare . Beatles Radio: The Beatles, Solos, Covers, Birthdays, News The Fab 4 and More! He's one of the most famous people on the planet and has been performing on stage for almost six decades. 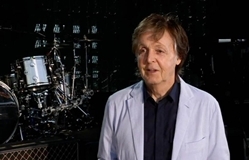 But at 75, Paul McCartney still has anxiety dreams about getting up in front of a crowd. "Ever since I started performing there's like a recurring dream which is, and I still have it to this day, which is you're in a stadium and you're playing with The Beatles or with a band and people start leaving and it's like, 'OK, what are we doing wrong?'" he said. "And we're trying to pull out the big one like, 'Quick, play Hey Jude, quick!' And they're still leaving. "'Quick, Long Tall Sally!' And they're just drifting away and you wake up in a cold sweat." The former Beatle sat down with 7.30 at the start of his Australian tour in Perth. Despite what you might think, he's not sick of playing his old songs. "The funny thing is, particularly these days, it's like I'm rediscovering them," he said. "You don't just sing and think of nothing. So I'm thinking of being in the studio with the guys when we did it. "I'm thinking of how I wrote it, and on some of them I'm looking at them thinking: 'This is a 24-year-old kid who wrote this', which happens to be me. I'm thinking: 'This isn't bad, it's pretty good'. "So that's what keeps you going. You're always hearing lines in the songs. Like Eleanor Rigby: 'The face that she keeps in a jar by the door' … you go and rediscover it as you go along." When creating the setlist for his concerts, he said he asks himself: "If I was going to a Paul McCartney concert, what would I want to see?